Star Wars: The Force Awakens may have got the world at large back on-board the Star Wars franchise, but there is a lot of other great stuff from a galaxy far far away out there to enjoy. One of those things is the Disney XD series Star Wars Rebels, which is currently two seasons deep. And with the Blu-ray release fastly approaching, we just got a whole bunch of great details about what we can look forward to. The new details for the release were dropped by Disney and come courtesy of LucasFilm. The season 2 release of Star Wars: Rebels will of course include all 22 episodes of the series and as is usual with a DVD or Blu-ray release, there will be a ton of never before seen, bonus footage. The Blu-ray will contain even more exclusive footage, as is typically the case. The release has the usual amount of deleted/extended scenes and commentary, but there are some pretty seemingly great and in-depth extras that could very well make the set worth a buy, even if you already watched all of season 2 as it aired. Both the DVD and the Blu-ray releases will include what are called Rebel Recons. These are essentially short companion pieces that dive into each individual episode that include details about the episode, behind-the-scenes footage and interviews. Though not lengthy, they should add a nice bit of well rounded depth to each episode. 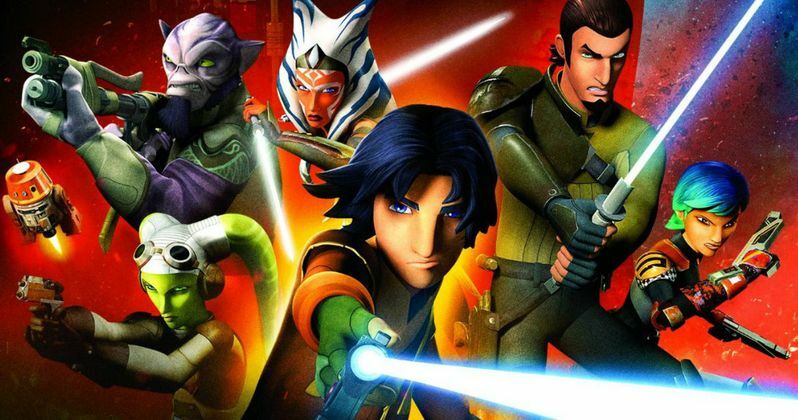 For the obsessive Star Wars fan in all of us, there is also a special feature called Connecting the Galaxy: Rebels Season Two. This featurette dives heavy into all of the hidden references, easter eggs and other connections to the larger Star Wars universe that are hidden within season 2 of Rebels, which should be pretty cool. For the Blu-ray release specifically, there is a featurette that dives heavily into the big ending of Rebels season 2, but this does venture into potential spoilers, so read on at your own risk or skip to the next paragraph. The featurette is called From Apprentice to Adversary: Vader vs. Ahsoka and has Executive Producer Dave Filoni taking a deep dive into the end of the season which finally gave us the showdown between Darth Vader and Ahsoka we had been waiting for. Ahsoka, of course, also appeared in the Star Wars: The Clone Wars animated series and had serious connections to Vader. So this was a long time coming. Lastly, we also get a look at the cover art for Rebels season two, and it prominently features Vader surrounded by the rest of the cast. For those that may not know, Rebels takes place roughly five years before the events of A New Hope and centers on a gang of Rebels led by Kana, who is voiced by Freddie Prinze Jr.. Season one of the show is out now on DVD and Blu-ray and those who are eagerly awaiting the second season release can look for it on August 30. Season 3 of Star Wars: Rebels is set to premiere this fall on Disney XD. Be sure to check out the artwork for the Rebels season 2 DVD and Blu-ray below.